Welcome to Gabriel Medina's website. Gabriel is a guitarist, composer, arranger, and producer originally from Argentina. He graduated from Berklee College of Music with a degree in Contemporary Music & Production. For 20 years, Gabriel has been playing the guitar in a variety of styles combining influences like Rock, Blues, Jazz, Funk, and South American music with Classical influences. 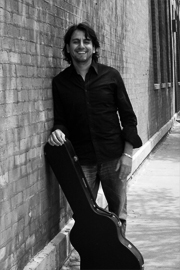 Gabriel has been a music and guitar teacher for students of all ages and from all over the world. Currently, he teaches private guitar, piano, and Spanish lessons, teaches at Old Town School of Folk Music, after school programs, and plays in the Chicago area.